Adults only have access to guns in shooting clubs. 4 out of 5 accidentally deaths of kids occur at home. Parents and baby sitters are allowed to use guns at home. 75% of children from five to fourteen never saw a gun. Both parents and baby sitters are not allowed to have guns. Almost 18,000 young guys bought a gun last year. It has influenced the death of children and teens. Children are expert in dealing with unlocked guns around their houses. Almost 18,000 children shot innocent people. Children are not included in this statistics. There are more deaths in the States with more guns. There are more deaths in the states with less guns. There are less deaths in the States with more guns. There aren´t more deaths in the states with more guns. 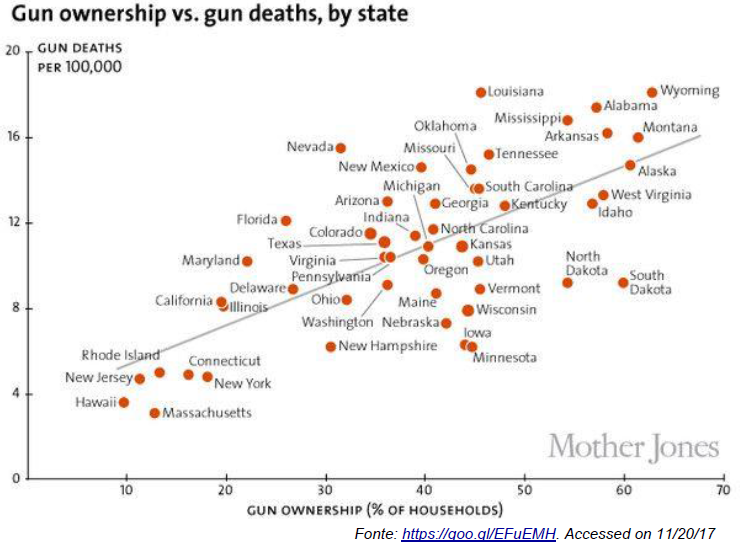 There is no relation between gun ownership and deaths. 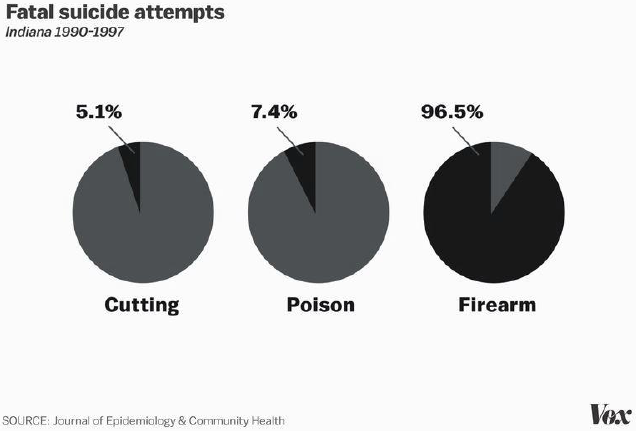 Perhaps the reason access to guns so strongly contributes to suicides is that guns are much deadlier than alternatives like cutting and poison. Jill Harkavy-Friedman, vice president of research for the American Foundation for Suicide Prevention, previously explained that this is why reducing access to guns can be so important to preventing suicides: Just stalling an attempt or making it less likely to result in death makes a huge difference. It is cheap to buy one in the USA. They are more lethal than cutting or poisoning. They are easy to hide from the cops. They are found in every home in the USA. They are more lethal than other options. The crises are not temporary. They can kill innocent people. They would sell the guns. They could easily hide them. Statistics points out that many young people commit suicide in the USA. The number of suicides has increased because people have easy access to guns. Once someone has escaped from an attempt to suicide, h/she will never try to do it again. Once someone tries to kill herself/himself and is not successful, there won´t be another attempts. It is fundamental to take the mechanisms of suicide away from the suicidal persons, since they won´t search another method right away. When countries reduced access to guns, they saw a drop in the number of firearm suicides. 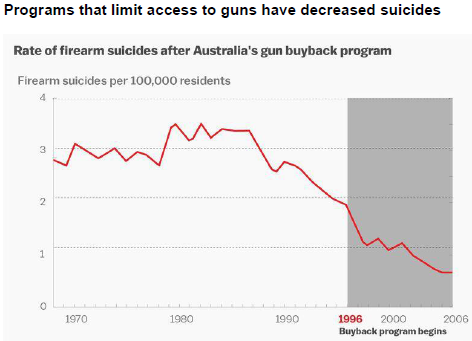 The data above, taken from a study by Australian researchers, shows that suicides dropped dramatically after the Australian government set up a gun buyback program that reduced the number of firearms in the country by about one-fifth. The Australian study found that buying back 3,500 guns per 100,000 people correlated with up to a 50 percent drop in firearm homicides, and a 74 percent drop in gun suicides. As Dylan Matthews noted for Vox, the drop in homicides wasn’t statistically significant. But the drop in suicides most definitely was — and the results are striking. Australia is far from alone in these types of results. A study from Israeli researchers found that suicides among Israeli soldiers dropped by 40 percent — particularly on weekends — when the military stopped letting soldiers take their guns home over the weekend. This data and research have a clear message: States and countries can significantly reduce the number of suicides by restricting access to guns. Its successful gun buyback program. The price the government paid for each gun. Not letting soldiers take their guns home over the weekend. Massive campaigns on Radio and TV. The terrorist attacks Australia has suffered since last decade.